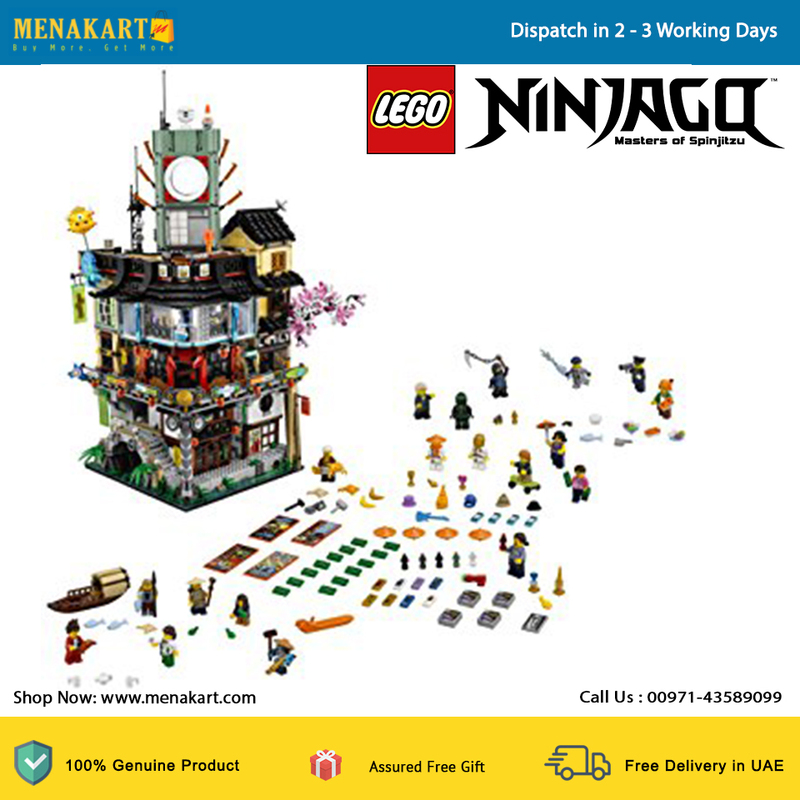 Experience endless fun in NINJAGO City, a huge detailed model with 3 floors connected by a sliding lift. On the 1st floor you will find a traditional fish market, a house, a bridge over a stream and a fishing boat. The 2nd floor is equipped with a modern clothing store, a comic book store, a tap restaurant with the possibility to grill crabs and an ATM. The vertical city is at the top of the apartment of Lloyd Garmadon and Misako, a sushi restaurant with conveyor belt and a radio tower. This super cool LEGO NINJAGO FILM full of action set contains no less than 16 minifigures and Sweep, the maintenance robot. 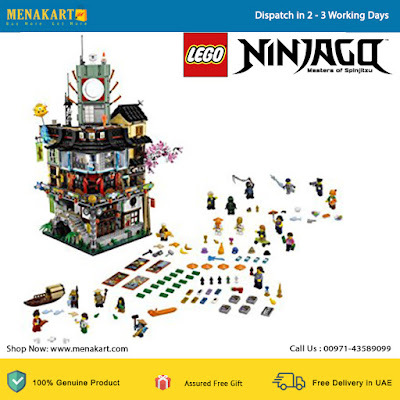 Includes 16 minifigures: Jay, Kai and Lloyd Garmadon (all in school uniform, new from August 2017), Green Ninja uniform, Misako, Jamanakai villager, Sally, Ivy Walker, Konrad, Severin Black, Tommy, Guy, Juno, Mother Doomsday, shooter from the shark army and agent Noonan, plus Sweep the maintenance robot. The set consists of a model of 3 levels (each floor can be removed to make playing easier) that are connected to each other by means of a sliding lift. There is also a traditional fishing boat. Level 1 includes a bridge, a sewer exit, a stream with translucent-blue and translucent-green water elements, a movable lift with space for a minifigure, a traditional fish market with fish and crack elements and a house with dining room and bedroom with sliding doors and fold-out 'solar panels'. You will also find the maintenance station of Sweep the maintenance robot with various tool elements and a taxi stand with telephone element. Level 2 is equipped with a modern clothing store with 2 display mannequins and various NINJAGO® product elements, a construction site with bonsai tree, a comic book shop with stone built board, a cash desk, a stall with comic books with various elements including collectable NINJAGO training cards, a krabrestaurant with stones built entrance board with crab and oven with 'crab grill function', a cash machine where money comes from, 15 banknotes (the machine can offer a maximum of 13) and a movie poster stand with 4 interchangeable movie poster elements. Place the raw cracker in the oven, turn the knob and open the oven ... and your grilled crab is ready. Press the lever behind the cash dispenser to conjure up banknotes. Level 3 has a radio tower, a modern sushi bar on the roof with conveyor belt for sushi and food made of stones, a toilet with sliding door, statues of fish made of stones and the apartment of Lloyd Garmadon and Misako with a window that can open, a bunk bed, a kitchenette and attic space for the minifigure of the Green Ninja uniform. Turn the knob to activate the conveyor belt with sushi. Weapons: Jay's thorny chain and the shooter's fish flame from the shark army.